While smartphones get thinner and faster, developments in the car industry are changing the world. Whether it’s electric vehicles emitting less harmful fumes, or artificial intelligence making autonomous cars a reality, these innovations will have the biggest impact on your life. Ready to get excited? These are the five biggest automotive innovations that are right around the corner. Before electric cars can become truly mainstream, their range needs to be able to compete with internal combustion engine vehicles. This can be done with either higher-density batteries or supercapacitors. Supercapacitors could have a sufficient energy density to comfortably surpass the 300-mile range that current electric vehicles top out at. So far, research has shown they’re more energy-dense than lithium-ion batteries, holding 180 watt-hours per kilogram compared with 100-120 watt-hours of traditional lithium-ion. Which technology is the automotive industry likely to go with? That remains to be seen, but Elon Musk has said a breakthrough in electric transportation is more likely to come from supercapacitors than from batteries. While we’re on the topic of batteries, it’s the perfect time to talk about charging tech. If car companies do choose to go down the supercapacitor route, electric vehicles could recharge in minutes rather than hours. Driving from London to Scotland? You might only have to stop for 10 minutes rather than the 40+ minutes currently needed to recharge. There are also several companies working towards wireless charging, which would make owning and living with an electric vehicle much easier. If car manufacturers can be believed, we could be cruising around in autonomous cars as early as 2025. Cars will be kitted out with an array of sensors that give the vehicle a 360-degree view of its environment. The type of sensor used will depend on the manufacturer, but most will use a combination of lidar, radar, laser and video cameras. These will give the car a 360-degree view of the world, with advanced AI in place to interpret the data from these sensors, keeping the vehicle on the road and reacting to scenarios as they happen. While your car does all the work for you, you’ll be able to relax and binge watch your favourite Netflix series on your way to work. This one is great for safety and absolutely necessary for a fully autonomous car future. Vehicle-to-vehicle communication is essentially cars talking to each other, and if all cars came equipped with this technology it could enable a more advanced convoy of cars on motorway journeys. With this tech, your car would be able to react in milliseconds to any changes in speed made by the car in front. Ultimately, this would reduce phantom traffic jams, increase road capacity (because you'd be able to fit more cars in a smaller space) and reduce accidents. V-2-V communication would also have safety benefits before autonomous vehicles become a reality. For example, you could receive a notification in your HUD if a motorcycle or emergency vehicle is quickly approaching from behind. You could also get notifications to warn you of potential hazards before they even come into view. For example, a notification could pop up to alert you to a car stopped in the road after a blind bend, giving you plenty of time to slow down. With vehicle-to-infrastructure communication, all cars could talk to signs and traffic lights, so warnings could also be displayed about these and they could intelligently reroute you to avoid accidents, congested areas or roads with warnings in place. Advances in artificial intelligence (AI) will be the main driving force behind autonomous vehicles. The biggest challenge that self­driving cars will have to overcome is the fact that no two situations will ever be the same. Plus, the vehicle will need to react to unique traffic, pedestrians and road conditions instantly. That’s where artificial intelligent comes in. 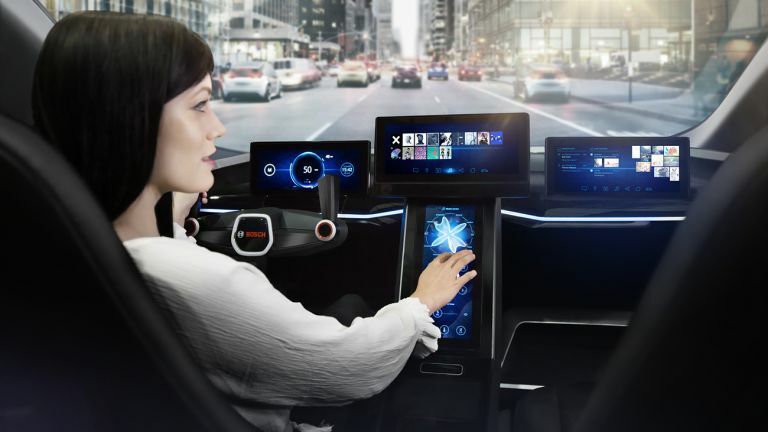 There’s no way that engineers will be able to predict and write instructions for every scenario so vehicle manufacturers will need to use big data and machine learning to make the vehicle act like a human driver. It requires an immense amount of processing power and extremely advanced sensors, but some of the biggest car and tech companies are all investing millions into AI research. AI won’t just benefit driverless vehicles. Companies are also developing learning systems that can record your everyday driving life and automate things to make them easier. For example, listen to Radio 2 on the morning commute and Classic FM on the way home? The car will learn this behaviour and change radio stations automatically.